They are young, they are handsome, and they will take their first steps in Juryo during the May (Natsu) Basho. Both are already stars in the world of sumo and if they fulfil only half what is expected from them, they will be famous for a long time to come. Their shikona? Hagiwara and Kotooshu. So why do we talk about Hagiwara and Kotooshu together? At first glance there could not be two more different rikishi. Hagiwara, Japanese like the vast majority of wrestlers, has the typical rikishi body 1,85 metres tall, and already 141 kg when he was only 17 (he was born on July 3, 1986). When he met him for the first time, Naruto oyakata (former yokozuna Takanosato, who enlisted him in his heya) was struck by his legs: �What did strike me [�] were his unbelievably athletic legs. Considering his age. I felt that I was looking at a tall oak strongly planted in the ground�. Mahlyanov Kaloyan Stefanov�s (Kotooshu�s real name) father was a Bulgarian wrestling federation champion. Nonetheless he has a very untypical physique for a rikishi. 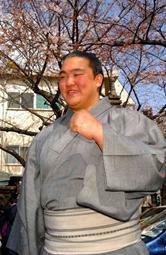 At 2,03m and 135 kg Kotooshu is the tallest active rikishi (the all time record belongs to a rikishi named Fudoiwa, who reached 2,14 m), he has a very slim body but that should fill out as he progresses. Three years older than Hagiwara, he was born on February 19, 1983. When he was 12, the young Mahlyanov joined a sports school, where he practiced Wrestling for 6 years. Even at this young age, this boy showed a passion for fighting : "After the trainings, we would get the wrestling covers and fight until we were exauted, just for fun. This occured two or three times per week." At the same time, the young man discovered sumo thanks to Bulgarian television. He fell in love with it and subsequently achieved third place in the under 115 kg class in the 2001 European championship, when he was only 18. The following year, he won his first tournament. In fact this victory in Germany turned out to be the first step in his career, as he had attracted the attention of a former member of Sadogatake beya. A year later, in September 2002, he joined the famous heya, managed by former yokozuna Kotozakura, leaving his beloved 750 cc motor-bike behind in Bulgaria. Happily, the okamisan (oyakata�s wife) took him under her wing, and brought him to a cyber-caf� where he could send news to his family. Little by little, he adapted. Hagiwara took his first steps in March 2002. Kotooshu passed his entrance examination 8 months later, in November. Both began very strongly. Hagiwara spent only two Basho in Jonokuchi and Jonidan, just long enough to achieve two 6-1 records. By the time Kotooshu entered Jonokuchi, Hagiwara was already Sandanme 49 west. The coming of the Bulgarian was like a thunderbolt. In his first Basho, he took the division, with a perfect 7-0 score. He struck everyone right away and they wondered how would they deal with this rikishi who was so tall it should have been a severe disadvantage. The Jan 2003 Basho really stood out, as foreign rikishi took 5 of the 6 division titles. Ahead of Kotooshu (Bulgaria) in Jonokuchi, Tokikenku (Mongolia), Kokkai (Georgia), Asasekiryu and Asashoryu, (both Mongolia), were respective winners in Sandanme, Makushita, Juryo and Makuuchi. In January 1956, he was higashi sei-yokozuna, the most prestigious rank. After 8 days of competition, only Kagamisato and the new Ozeki Wakanohana I are undefeated among the higher ranks. Tochinishiki is following close behind and on day 9, he defeated Wakanohana I, thus leaving Kagamisato as the sole leader. Unfortunately, this victory sparked a bad streak for the Kasugano-beya yokozuna and he lost five bouts in a row. Tochinishiki's hopes for the title were dashed! For his part, ozeki Wakanohana I from Hanakago-beya was defeated on day 11 by Yoshibayama. Kagamisato, alone held the lead, and had the opportunity to claim the basho the next day as he would fight Wakanohana I. But Wakanohana I defeated the yokozuna. Over the final 3 days, neither of the two rivals would fail. Kagamisato won his second consecutive tournament scoring an excellent 14-1 record. Hagiwara was showing that in spite of his age, he was a rikishi to be taken seriously. Naruto oyakata had had an inkling of this, as he spent two hours daily with Hagiwara in private, giving him advice, which is very rare for a wrestler at that level �I told him [as soon as he came to Naruto beya] that I expected him to become the tenth wrestler I brought to Makuuchi�. said the former yokozuna, who further adds on another occasion : �I realized at once that he had enormous potential and that I had to personally hand down my knowledge to him�. While Hagiwara adapted himself fairly quickly to the higher level, Kotooshu progressed like a Shinkansen (Japanese bullet train) ! Before his second tournament, he was injured in a training match against a makushita wrestler. That injury however didn�t prevent him from winning 6 bouts, and giving evidence of both his comfort at that level, and his strong willpower. In his four first Basho, he lost only three matches. At this point, only two fighters had succeeded in defeating him twice : Dairaido, and� Hagiwara. In September 2003, Kotooshu was the same level as Hagiwara who was by now well used Makushita. They were ranked respectively makushita 33 and 35. 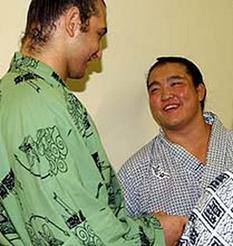 On day 9 of this (2003 aki) Basho, the two young fighters meet for the first time. The fight ended with Hagiwara victorious, but both rikishi finish with 5-2 records. In November, they didn�t meet, but kept on progressing : 5 - 2 for Kotooshu, 4 - 3 for Hagiwara. Dairaido in fact succeeded on this occasion in defeating both of them ; he is the only wrester to have achieved this distinction. 2004 will surely be remembered in sumo�s history as the year when the Hagiwara-Kotooshu rivalry really began. In January, they are both near the top of the makushita rankings : east makushita 18 for Hagiwara, east makushita 8 for Kotooshu. The two fighters easily rack up the victories, and it seems likely that the winner of their bout will take the yusho. Hagiwara manages once more to defeat Kotooshu and at the same time take the yusho. Kotooshu, who finishes with 6 victories, finds himself unlucky not to be promoted to Juryo. Kotooshu is extremely disappointed, but Hagiwara at 17 years and 6 months old, becomes the third youngest makushita division winner. Only yokozuna Takanohana and Kashiwado did better, and Hagiwara now starts to feel the weight of expectation. In March 2004 Kotooshu gets his revenge. Beating Hagiwara for the first time, he achieves a perfect 7-0 score and wins the Makushita division yusho. Hagiwara, finishes with 5 victories, and 2 defeats (against Kotooshu and Nadatsukasa). After the 2004 haru basho finishes both rikishi are promoted together to Juryo, and make history. Kotooshu becomes one of the fastest wrestlers to go from entering Jonokuchi to sekitori promotion, needing only 9 basho. Thus he is faster than either Roho or Kokkai, and finds himself in sumo�s annals in company with some the greatest sekitori (In joint 4th position, with Asashoryu and Takanohana). Hagiwara, becomes the second youngest sekitori ever, just behind � Takanohana. If both rikishi follow in the footsteps of their glorious predecessors, one can expect them to become, at the very least ozeki. They probably already have had occasion to discuss that with the rikishi they were tsukebito of : Kotooshu was Kotomitsuki�s tsukebito and Hagiwara Wakanosato�s � I hope I became as powerful as Wakanosato-zeki�. Hagiwara and Kotooshu, like all the great rikishi, are furious fighters . Hagiwara prefers to practise oshi-sumo (thrusting sumo ), and uses all his leg strength . But he knows too, how to go and seek his opponent�s mawashi when he needs to. What strikes you when watching him wrestle is the high technical level he has already reached, despite being so young. Kotooshu, still seems to need a lot of work on the technical side of his sumo. Unlike Hagiwara, he hasn�t much recourse to his legs, and relies a lot on his pugnacity and strong upper body. His big problem is trying to forget techniques he learned while in wrestling, and put into practice Sadogatake oyakata�s advice: attack moving forward quickly, powerfully and without any hesitation! He mostly is working on developing yostu-sumo�s techniques. �When I meet smaller opponents, I like to lift them up , in order to eject them from the dohyo with strong thrusts�. Hagiwara and Kotooshu have now begun to train with their new sekitori partners. In their first training session with Juryo wrestlers Hagiwara won 5 of 12 fights, and Kotooshu 4 of the 7 he contested . These were good results , which point to kachi-koshi in May. However, we shouldn�t expect miracles, and we will still need to watch a lot of basho before these two outstanding fighters can really fight against the greatest. Asashoryu should have two years yet before he has to worry. Or does he have to wait? During this first training as sekitori, both young men were taken by surprise when they saw Asashoryu coming out of the dark to give them some advice �Don�t decrease your strength on the dohyo�s edges, or you will get hurt!�. Then he offered his chest to Kotooshu and let him practice some thrusts (butsugari-geiko). It�s very unusual to see a yokozuna giving advice to Juryo wrestlers who don�t belong to his heya. �I�m very grateful � said Hagiwara. Just like the great yokozuna Taiho (32 yusho) in the 60�s, Asashoryu keeps an eye on the newcomers improvements. The general commotion surrounding both these young men remind a lot of people of what happened in the 90�s with Akebono and the Hanada brothers (Takonahana and Wakanohana).Will Kotooshu and Hagiwara be such a success? We can all wish so for them but it will surely take a long time for that stage to be reached. For the moment, the time has come for final preparations for their first basho as sekitori, and in particular for the making of their kesho-mawashi (ceremonial aprons). Hagiwara�s will show a wild tiger, and a mountain in the background, and Kotooshu�s a jumping horse, surrounded by the three colours of the Bulgarian flag: white, green and red.